Envision a world where equestrians experience unimagined possibilities in their horsemanship journey. Barbara H. Callihan and Lisa Horning have joined forces and bring together more than 100 years of combined award-winning equestrian experience, expertise, passion, and joy across multiple disciplines. Their mission is to deliver high quality, diverse, and unique learning opportunities and events to the Southern Nevada equestrian community that expose trainers and riders to new, creative, and fun ways to strengthen their partnership with their equine partners and achieve their personal horsemanship goals. Barbara and Lisa have joined forces because of a shared vision that versatility is the secret to a better overall partnership with your equine partner. They believe that crosstraining across multiple working disciplines elicits enrichment of any horse’s development. The benefits of crosstraining your horse include improved symmetry and balance, posture, responsiveness, flexibility and communication between horse and rider. It also promotes soundness, an agile mental capacity, muscle conditioning, straightness, and smooth transitions. Exposure to multiple working disciplines builds confidence in the rider by encouraging them to focus on their own cues, posture, and quietness of the hands, which allows them to be more in sync with their horse. When combined these benefits lift equestrian athleticism to new heights and strengthens the partnership and bond between riders and their equine partners. Additionally, exposure to a wide variety of philosophies, techniques, and skills gives equestrians access to many successful approaches, allowing them to create personal and customized approaches to achieving personal equestrian excellence. Supporting each equestrian’s personal and spiritual horsemanship journey is at the heart of their collaborative initiative. Lisa has taken her next steps by retiring from employment to embrace her equestrian journey full-time and to specifically launch this initiative — her newest passion. Her immediate goals are to become a certified Extreme Mountain Trail judge, a certified judge in Western Dressage and Cowboy Dressage — followed by becoming an ‘r’ rated judge in all disciplines for Morgan breeds — her favorite breed, and eventually a National Reining Horse Association judge — her competitive passion of passions. Barbara has taken her next steps to join Lisa in this initiative by making her facilities available for the clinics, events, and lessons. She will also lead and direct all the training, seasoning, finishing and showing of all horses that will be acquired and prepared for sale. And finally, she is working closely with Lisa who has committed herself to become an assistant trainer and protege. Both Barbara and Lisa are enrolled in the upcoming Western Dressage Train the Trainers™ clinic hosted by the California Western Dressage Association on Monday and Tuesday, April 15 and 16 at Cottonwood Farm in Las Vegas. This two-day Train the Trainers™ program, originally developed by the Western Dressage Association of America®, is designed to educate professional trainers, judges and Western Dressage enthusiasts who want to learn the standards of Western Dressage and how to train, hold clinics, show and judge this exciting new discipline. As their first venture, Barbara and Lisa have purchased a Morgan mare that will be trained Extreme Mountain Trail and reining; upon completion of training, the mare will be offered for sale. The mare is an NVS Midas grand-daughter, Jaf Sunrise Prairie Rose — fondly known as Moxie. Lisa’s dedication in her breeding program of selecting specific bloodlines is a credit to her belief in the Morgan Breed and her consistent protection of breeding for the quality of the working Morgan through her stallion NVS Midas, who has passed these preferred traits to Moxie, his grand-get. Barbara has been working with Moxie for one month in an Extreme Mountain Trail training program and already exhibits an extremely sound mind and excellent work ethic. Stay tuned as in this venture unfolds. Barbara Callihan introduces Moxie to the Swinging Bridge at Equestrian Trail Park of Southern Nevada. The date of their second venture will be announced this week, as they are excited to bring Olympic Dressage trainer and clinician — Sasha Stark — to Happy Hoof Beats Equestrian Center for individual coaching clinic sessions. Watch for more information to be released soon. Sasha Stark on Chocolat, June 15-17, 2012 Golden State Dressage Classic***, 61% at Grand Prix. We invite you to share in Barbara and Lisa’s love of learning, to experience the joy of following your equestrian dreams, to experience support and encouragement from professionals who want you to succeed, and to discover new possibilities in horsemanship. You may stay informed by liking the Happy Hoof Beats Facebook page and signing up for the Happy Hoof Beats Equestrian Center email list. It’s spring time which means it’s time to complete maintenance and repair at HHB. Just like our tagline states — Safety First — our main goal is to make sure HHB is a very clean and safe equestrian facility. This year’s maintenance is a bit more complicated because we now have 29 Mountain Trail Obstacles that demand tender loving care. And as promised when we opened the Trail Park in October, we are committed to keeping the facility in excellent condition so that you can count on having access to all the obstacles on the Trail Park. If you have already booked Trail Park access or lessons at HHB in the next three weeks, we will honor your appointment and there is no need for you to change anything. The only difference may be that certain obstacles may not be available on certain days. In order to complete required maintenance and repairs before the summer heat sets in, we’ve decided to close the Equestrian Trail Park to the public for about three weeks, with an estimated reopening of Monday, April 24th. During this time the HHB maintenance crew will work diligently to take care of all the issues that need attention. The crew we work all have other jobs and commitments and are only available to HHB on a part-time basis on certain days. They will complete most of their work on weekends, with additional work being complete some days during the week. We work with this crew because they have been with HHB since the grand opening of the Trail Park and offer their services at a very affordable price, allowing us to keep expenses down, and prices low. When Mark Bolender was here for the Intermediate Clinic, we asked him to do a walk through and provide us with recommendations on how to address the maintenance and repairs issues that we had discovered. The low humidity and high heat have had a brutal effect on the wooden obstacles, requiring us to be creative in how we maintaining and repair them so that riders can safely use them. Jason and Sam, who will do most of this work, helped to complete a assessment of the entire facility this past weekend and began tackling the projects because there is so much work to be done. Complete the removal of all the original materials by hand, no tools, careful not to step on rocks that will will breakthrough the bottom liners — time consuming!!! So we thank you for your patience as we complete these projects so that you can safely enjoy HHB Equestrian Trail Park for the next six months. And we apologize for any inconvenience this causes anyone. Photo Above: Barbara H. Callihan and Chunky Monkey #BridlelessAndBareback — An Advanced Extreme Mountain Trail Technique. Over the past several weeks I’ve had conversations with most of the graduates of the Introduction to Mountain Trail Clinics since October, and a common concern among those who have completed is that many of you feel you are not ‘ready’ for the Intermediate Mountain Trail Clinic, or that it might be unsafe for you and/or your horse. What if I am not an Intermediate rider? I can’t do the more challenging obstacles yet with my horse, what would I get out of this clinic? Am I ready for the Intermediate Mountain Trail Clinic? Finally, I would also suggest that something magical happens when you take a leap of faith and commit yourself to step outside your comfort zone to trust those with the knowledge and experience to mentor you so that you can experience breakthroughs. Mark H. Bolender is one of the most talented, insightful, supportive, creative, aware, truthful equestrian coaches that I have ever had the joy of working with. He is completely dedicated to your success and your safety. He draws from life experiences with a sense of joy and kindness that puts riders at ease even during the most challenging moments. His wife Lee, his partner during the clinics, quietly works with the individual riders to help them integrate the nuances of the techniques and skills while Mark is giving personal attention to individual riders. She is the eyes behind his back, always aware if someone needs more direction from Mark, and focussed on keeping all riders engaged and safe. Mark and Lee believe in your possibilities and will help you experience the trail ride of your dreams! Almost two years ago, at a time when I was not being kind to myself in thoughts, when I was heavy in negative judgement, and when I could not appreciate my past successes nor could I see a future for myself that included horses, a quiet and persistent voice led me to Bolender Horse Park. It had been over 35 years since I had reached out to another equestrian coach, and I knew I was ready to become the student. Lordy I was scared. Yet, I knew in my belly that this man would not only reveal to me new awareness, knowledge, and skills but he would also inspire me to become my new best self. Two years later, he continues to be a powerful force in my equestrian transformation and inspires me to pay it forward through HHB Equestrian Trail Park of Southern Nevada. If you trust Mark, I know he can make a difference in your equestrian journey. I encourage you to seriously consider registering for the Intermediate Mountain Trail coaching clinic on March 24 and 25 today. Get out of your comfort zone and experience great rewards. Sign up on EventBrite Today, or contact me today to discuss your next steps. Photo Above: Rider — Barbara H. Callihan; Horse — Chunkey Monkey. Photo Credit: Maja Reilley. We’ve been working diligently the past several weeks putting finishing touches on a robust Winter and Spring schedule of Mountain Trail activities at HHB Equestrian Trail Park of Southern Nevada, including launching our online HHB Calendar — check it out. Mark and Lee Bolender return in February for an IMTCA Mountain Trail Judge’s Clinic that can provide riders/handlers keen insight to how to prepare for Challenges! We’ve also scheduled our first Schooling Challenge in April to give you an opportunity to get a sense of how the competitive side of Mountain Trail works and put your new skills to the test. In October we’ll celebrate our one year anniversary with an official IMTCA Challenge where riders/handlers from across the nation will join us to compete for wonderful prizes. We encourage you to use the next six month to as much experience on the Trail Park as possible by scheduling lessons and park access. 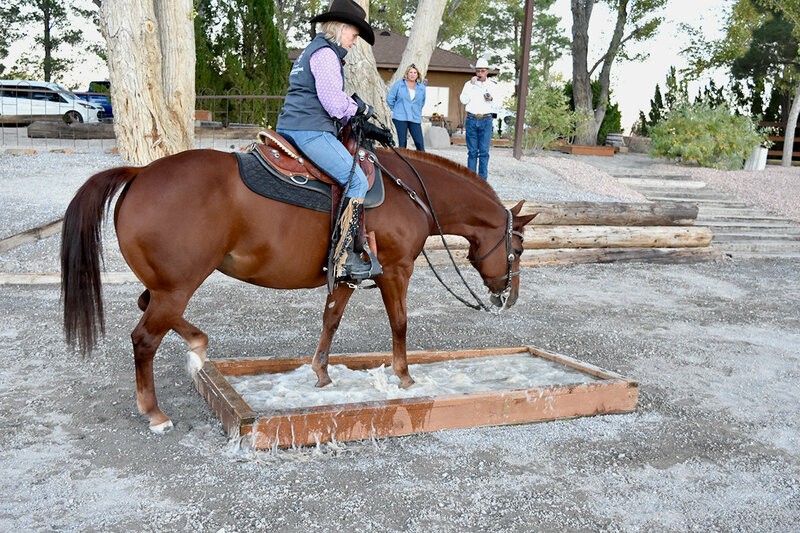 (PAHRUMP, NEVADA) October 21, 2017 – Happy Hoof Beats (HHB) Equestrian Center announces the grand opening of the Happy Hoof Beats (HHB) Equestrian Trail Park of Southern Nevada, the Southwest’s first state-of-the-art Extreme Mountain Trail Course. Designed by three-time National Mountain Trail Champion, Mark H. Bolender, the premier facility promotes greater horsemanship to horse lovers of all skill levels and equestrian disciplines. The public is invited to the grand opening reception and walk through on Saturday, October 21st at 4:00 pm. Guests are asked to RSVP via EventBrite. HHB Equestrian Trail Park is Southern Nevada’s first and only Extreme Mountain Trail course and event center sanctioned by the International Mountain Trail Challenge Association. The course features 26 natural obstacles, including a rock path, stairs and a swinging bridge that mimic trails from around the world. Bolender designed the course so that riders and handlers can gain the skills and strategies necessary to overcome challenges in a safe, fun learning environment. A two-day introduction to Extreme Mountain Trail coaching clinic scheduled for October 21 and 22 has already sold out for participants with horses under saddle or in-hand. Auditing spots remain available. Anyone interested in auditing or signing up on the waitlist for the next coaching clinic in November may do so by visiting the registration page on EventBrite. Mountain Trail is one of the fastest growing trail disciplines in the world. Started in Oregon in 2001, the sport has expanded to Canada and Europe, and is making a bid to become an Olympic sport. Mountain Trail challenges horse and rider to navigate trail obstacles with technical accuracy, subtlety and finesse at varying gaits and speeds. Mountain Trail stands apart from other equestrian disciplines because it can be enjoyed by riders of any age and skill level, and by every breed of horse, mule or donkey under saddle or in-hand. Located an hour west of Las Vegas towards Death Valley National Park, the Equestrian Trail Park will be open to the public via a reservation system. People can use the facility for individual and group coaching, horse training and conditioning, social gatherings and events. In order to maintain the safety of every participant, eligible riders must complete an 'Introduction to Mountain Trail' group coaching session or take individual lessons with an approved trainer, including Mark H. Bolender or Barbara H. Callihan. The facility offers group and individual coaching sessions and packages, and will host the first Mountain Trail Challenge in the spring of 2018. Happy Hoof Beats Equestrian Trail Park of Southern Nevada is the Southwest’s first state-of-the-art Extreme Mountain Trail Course. Designed and constructed by three-time national champion Mark H. Bolender, the premier facility is Nevada’s first and only Extreme Mountain Trail Course and event center sanctioned by the International Mountain Trail Challenge Association. The park features 26 natural mountain obstacles that help horses, riders and handlers to develop the skills, confidence and strategies needed to navigate challenges they’d find on various trails around the world. Most importantly, the venue welcomes equestrians and horse enthusiasts from all skill levels and disciplines to celebrate Mountain Trail in a safe, fun, educational, recreational and competitive environment. For more information, please visit HHB Equestrian Trail Park. Barbara H. Callihan founded HHB Equestrian Center in 2005. The Equestrian Center offers personalized individual and group coaching programs that enables riders of all ages and skill level to achieve their goals and enjoy their equestrian journey. Located in Pahrump, an hour west of Las Vegas towards Death Valley National Park, this facility borders Bureau of Land Management land with open riding available all the way to California. The Equestrian Center also features the Southwest’s first state-of-the-art Extreme Mountain Trail Course that gives riders the skills to navigate local trails safely and confidently and participate in the emerging trail discipline. Above all, the Equestrian Center welcomes people from all walks of life to be a part of equestrian fellowship and have the opportunity to develop horsemanship skills that lead to personal transformation. Barbara is a third generation equestrian trainer and coach who has earned an impeccable reputation as one of the most respected horsewomen in Southern Nevada. An equestrian professional for 60 years, she operates Happy Hoof Beats (HHB) Equestrian Center, where she develops personalized programs for equestrians of all ages and skill levels, and trains horses using safe, learned techniques and communication based on a quiet seat and hands, good timing and a strong consistent reward system. She also offers group coaching sessions through her innovative coaching instrument, Equestrian Coaching Edge™. In 2017, she founded HHB Equestrian Trail Park of Southern Nevada, the region’s premier Extreme Mountain Trail Equestrian Trail Park. Barbara remains passionate about the equestrian community, and takes great pride in fostering fellowship among equestrians who celebrate their love of horses.